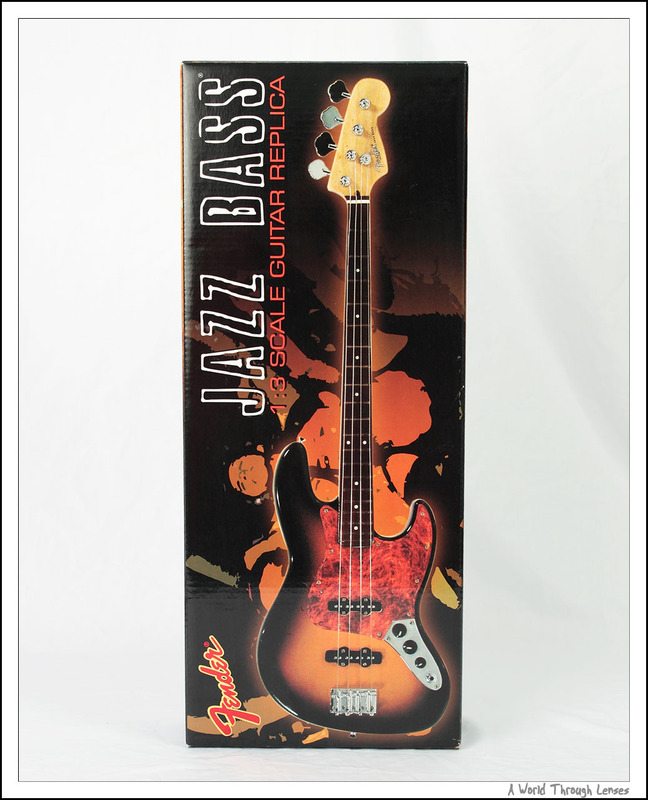 The guitar saber’s using is a 1/3 scaled die-cast Fender Jazz Bass made by GMP Diecast. The guitar was a nice piece of art, very detailed and solid. However the guitar holder that came with the guitar is terrible. The coating on the meta frame actually start to rub off onto the guitars as you display it. 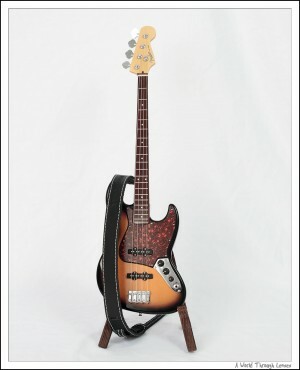 So I purchased a wood guitar stand and a leather guitar strap from Arts Guitar in Japan. Below to the left is the GMP Diecast Fender Jazz Bass’s box packaging. To the right is the guitar on the Arts Guitar guitar stand with the leather guitar strap. The guitars are actually now out of stock from GMP Direcast. However, Arts Guitar in Japan actually still have these guitars for sell (probably imported from GMP Diecast). And I’m sure K-ON had some influences in this. So here’s Saber holding the guitar. The guitar strap is adjustable and can have 4 different length settings. It seems to be made to fit these GMP Diecast guitars exactly, the holes cut into the straps are an exact fit for the GMP Diecast guitar. Gothic dress, golden curly hair and a guitar, now that’s my way of girls with guitars. Saber’s finishing up with her guitar performance. One more shot from the back as Saber leaves the stage. The Black Skull Cat dress itself is also very nice. Saber looked really cute in this outfit. I think it’s a better fit for Saber than Kanu. Saber got a bit tired after all that guitar swinging action. Having a bit rest on the sofa holding her beloved guitar. Could you tell me what body / head / or whatnot you have for her? I’m just getting into Dollfies, and I’m not sure where to start (and I’d like to start off as best as possible 🙂 ). I actually just have 3 what Volks calls image characters. Saber from fate/stay night series, Kanu Unchou from Ikkitousen series, and Tohsaka Rin from fate/stay night series. Those are all specific character that came with their custom head for the character. Same goes for wigs and eyes, all came with the dollfie custom for that character. I did not buy any extra body or head, as long as I’m careful not to break anything or stain the dollfie I think I’m fine with these 3 bodies. I did buy a few other wigs. And if you look through my doll posts you can see I change wigs for these dolls. And of course a ton of clothing. 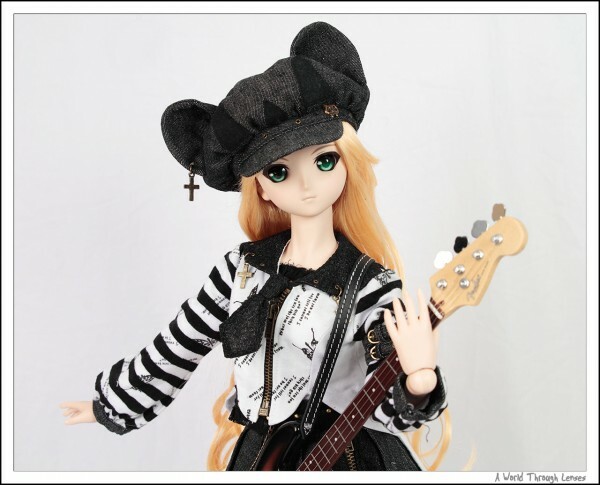 As for start, if you buy one of those image characters as your first dollfie dream, then it’s a good start already, it came with everything you need including the first set of clothing, then you just go from there. My clothing collection just kept on growing larger as I see other nice outfits for my girls. Just buy whatever you think looks good on your doll. Thanks for the information – I had the same thought too. I’m interested in getting a Nanoha DD (likely off eBay) so I’ll have her custom clothes to start off with, and go from there. Also, do you know what online shops will be selling the K-ON! dollfies? Yeah. Saber well the Original Saber is one of the most expensive dollfie dream to start with. With most other dollfie dream at around 60,000 JPY, The original Saber (not the Alter) version was 95,000 JPY. So naturally price on auction was high. Although the later released Saber Alter apparently also carries a high price similar to the original Saber. I guess supply and demand and Saber is popular. As for K-ON. The best bet for people outside of Japan with out going through a deputy service would be Volks International‘s Dolpa After Event (Probably in form of a lottery), as well as Volks USA probably will have some too (again in form of a lottery). 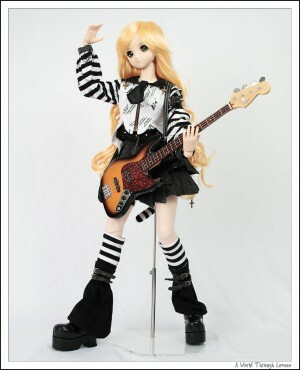 Since K-ON dolls’ release schedule has not been released, so there’s no more information on it. 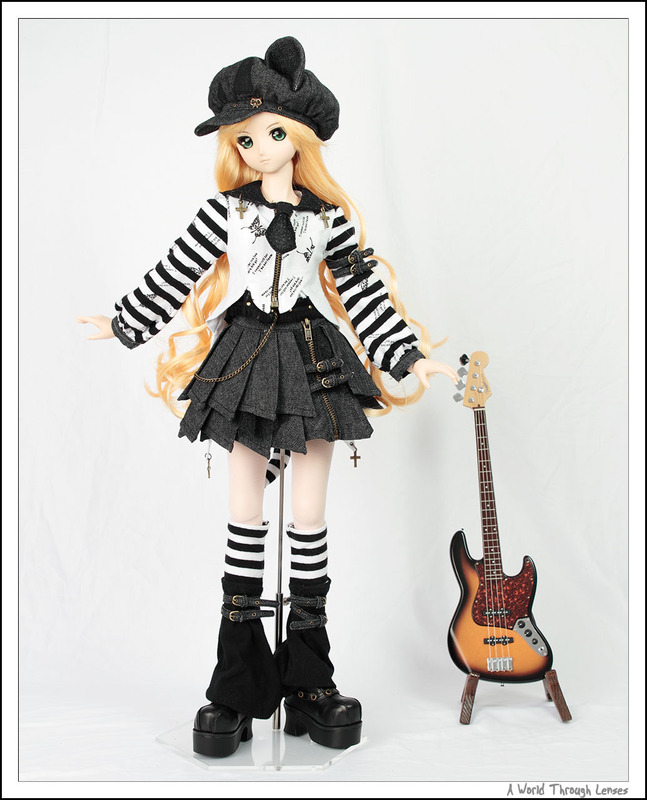 But you can go on those web site and check out some of the past Dolpa related item and see how those works. 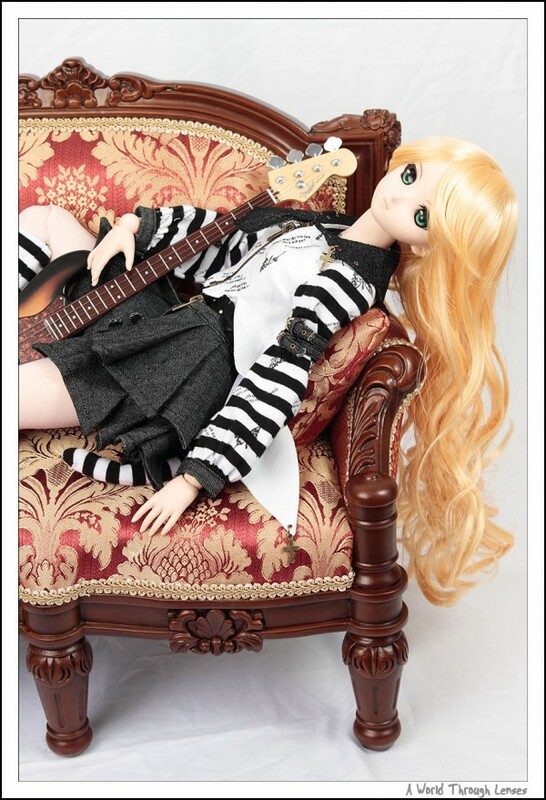 K-OK dolls will probably be certain to be released on one of the Dolpas. Outside of those, then your choice will probably down to Yahoo Japan Auction through a deputy service. If I can’t get Nanoha for a reasonable price either, I may have to let her go too. In regards to K-ON! – I’ll look into a few proxy / ‘deputy’ services and see what they say. I prefer Yui out of the two though. Mio’s cute, but I think they could have done her better. But I can’t order them? If you are in North America, the cheapest way to own a Volks special DD would be through Volks USA’s lottery. 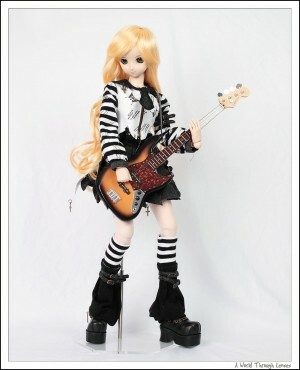 I’m sure K-ON will go on Volks USA’s lottery, just won’t be able to know how many will be available. Of course being a lottery, it means you can lose the lottery. So if you want to make sure you get one, a proxy/deputy probably is the only way to go. Now if you actually came across good deputies that will get Dolpa or Doll Show items in Japan then I’d be appreciated if you let me know as well. I currently only uses Yahoo Japan Auction deputies and so it limits my ability to get certain items. Agreed that Mio could have done better. That face is a bit lacking. 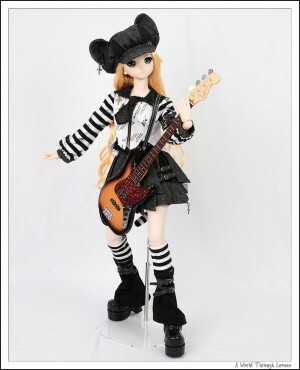 And I certainly was hoping they’d release that gothic dress set for Mio at least. But I guess they can always do so later if they proven to be popular. As for Moe and Natuski, yeah you have missed the timing already. Volks release stuff in small quantities. And so you have to watch closely to every Volks release and fight at the front line when it is open for order to get most of the hot items. Moe and Natuski was long sold out at Volks International and was on a lottery at Volks USA a while back. You won’t be able to get any of those item now. 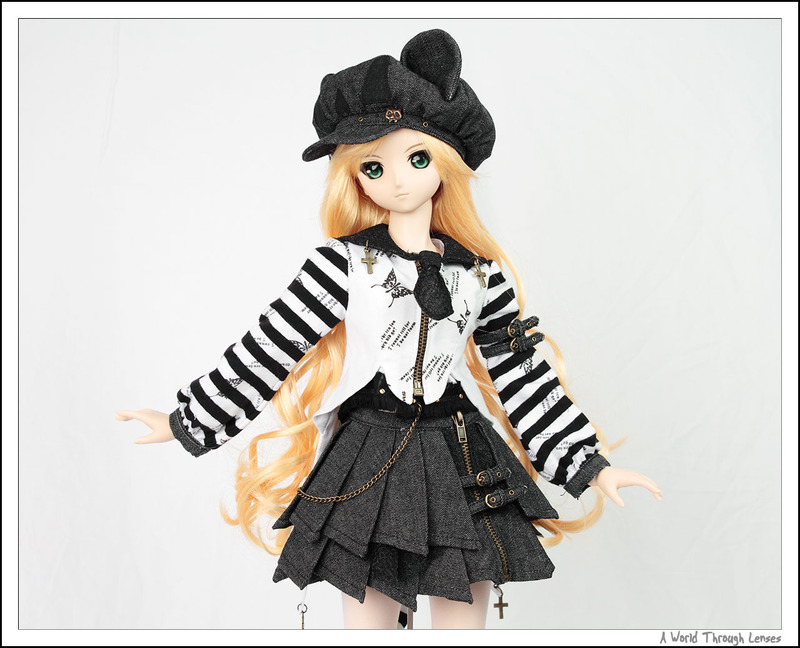 The “current” event at Volks International would be the February 2010 New Outfit Collection which started February 13th. If you look at the main DD web page now you will see most items are sold out already. In fact hot items will be quickly sold out during the first few hours of release. Well if you are in North America then you have two chances, one from Volks International and in most cases you have one more chance from Volks USA. Typically the chance at Volks USA is a better chance since DDs are not as popular in North America yet. However, you still have to fight at the front line for the hot items. 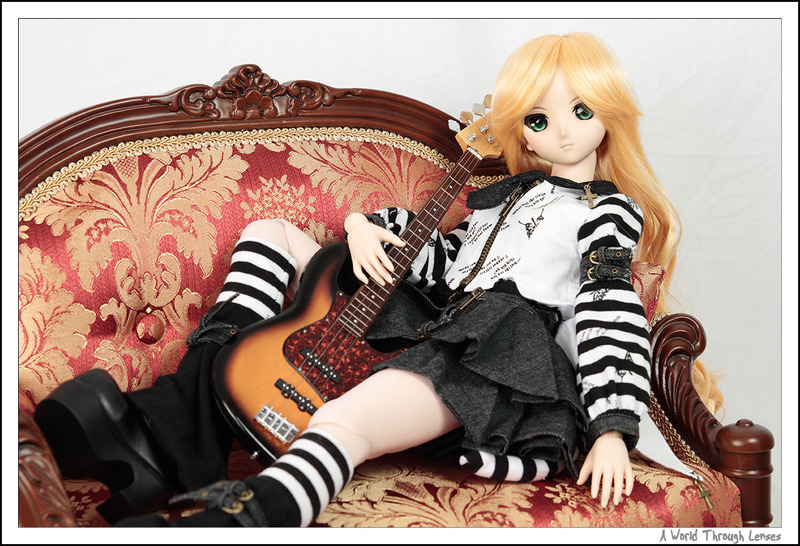 That sofa chair I use in this post for example, I wasn’t able to see any on Volks International even seconds into they open for order. 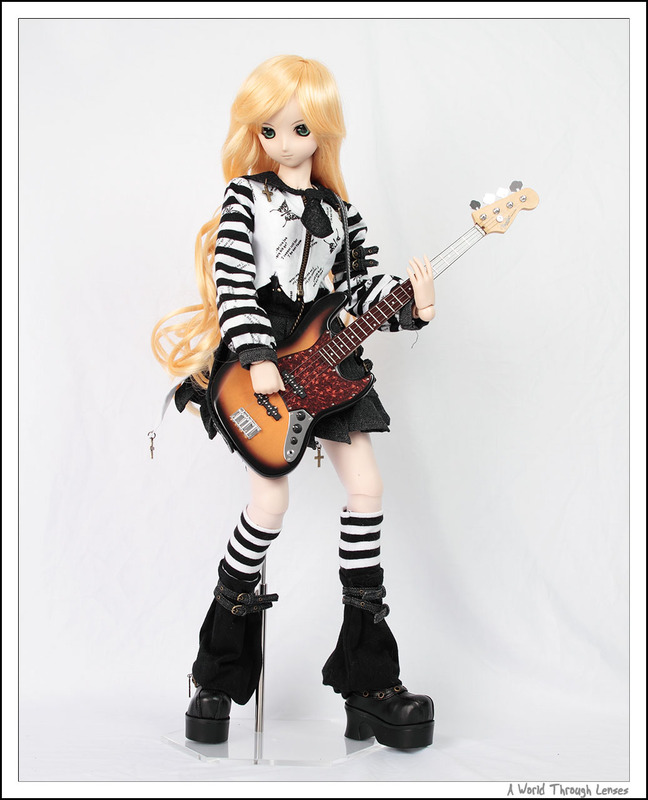 And on Volks USA, it was sold out in less than an hour I think. Keep you eyes on the Volks both International and USA (again if you are in North America, if not then International only), and keep on top of their events and schedules and so on would be your best bet to get stuff from Volks directly. 😉 If all else failed, well there’s always auction, just have to pay a lot more. I’m in the UK (England), so looks like I’ll be going with Volks International. I’m in the process of finding a good proxy, as some friends of mine currently use some for their own stuff. (Can’t find them on eBay either). 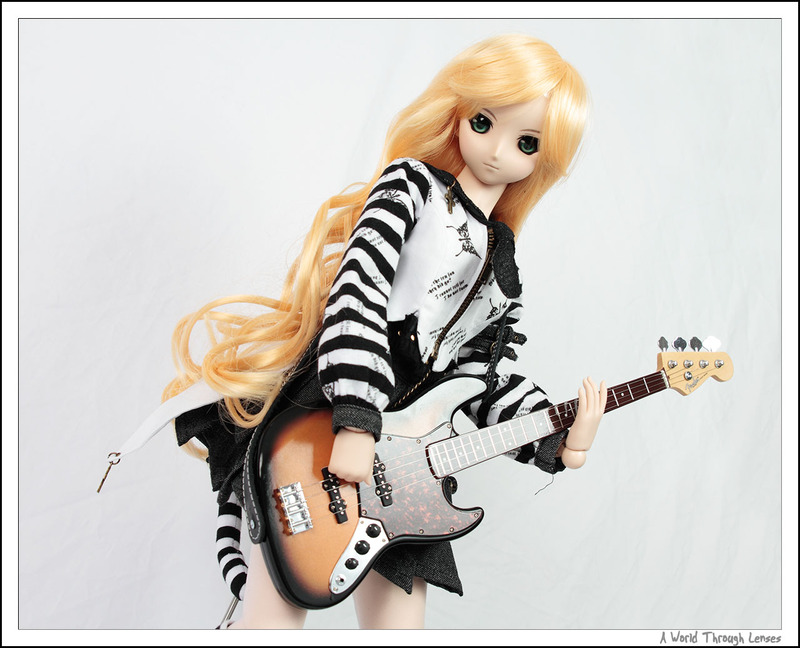 So when do you think Volks are likely to update with K-ON? I heard March sometime, but unfortunately I can’t be on the website ALL the time haha. On or around the 15th of March? Check out the main page http://www.volks.co.jp/en/ in the Latest New section around March 15th. There should be some details to the after party. Then obviously make sure you follow up when lottery information is release. Of course make sure you registered on Volks International can can log in before the lottery event starts if you haven’t done so already. Think it’s a good buy? Keep in mind that you have to pay for all the extra fees if you buy from Yahoo Japan Auction. For example, the one you listed is 94,500 JPY. So if you get that through CrescentShop, you will have to pay 9,338 JPY for the commission + bank wire. Then you will have to another some 2,000 JPY because Dollfie’s box are oversized. So that would be around 11,338 JPY fee + 94,500 JPY auction = 105,838 JPY. And CrescentShop has their own exchange rate. Today their exchange rate is 86.29 so that comes to $1226.54 USD. And then you have to pay for shipping from CrescentShop to you. It’s not much of a saving vs. $1310.00 USD on eBay which included shipping already. It will be a bit cheaper if you go through Shopping Mall Japan. Their commission is $64.50 USD + $2.5 USD bank wire fee. Last time I bought a doll through them they charged me 600 yen extra for a box. But that will come to <$7 USD extra. And Shopping Mall Japan's exchange rate is xe.com rate – 4. So that would be 87 today. Making the total $1160.21 USD. Again here you need to add shipping from Japan to you. As for couldn't get others to find any items. I'm not sure. I search in Japanese directly on Yahoo Japan Auction and use the deputies just for bidding, I don’t use them for searching. So I can't really comment on it. I did a quickly search for Nanoha on YJA. And yes it seems the one you listed is the cheapest new item. Well anyway CrescentShop is not too much cheaper (might even be more expensive depend on the shipping cost) than buying over eBay. SMJ is a tad cheaper. But that price is crazy, and the seller gives his reason as it being ‘special edition’. Do you think it’d be easier / better if I just went for the eBay option? Yep that’s the same Nanoha that I was referring to ($1,255 USD + $55 USD shipping, okay I missed insurance $2 extra. So $1312 USD total). And yes it seems to be the same item as far as I can tell. Yeah the other ones are just out there “fishing” for bigger gains. There’s no such thing as a “special edition” since all of them are the same as far as DD Nanoha is concerned. 1,300 – 1,500 USD is about a reasonable price IMO. Anything more are just simply pure profit taking. Though I do have one other question, and that’s what outfits fit her? Is she the standard size, or what outfits clothes are available / from where? Nanoha is a DD Base Body 2 with a M bust. So essentially the same identical body as my Saber/Tohsaka Rin. As for what clothing fits her, on Volks anything for DD will fit. But if the clothing is designed for L bust or DDdy then it might be too loose around the bust area to fit or look bad due to it being too loose around the chest. Clothing designed for SD can fit as well. There’s no guarantees but at least in general since they are both 60cm dolls they should fit. For example the Black Skull Cat dress set Saber is wearing on this post is a SD clothing and Saber’s also wearing a wig that’s for SD not DD. AZone international’s 1/3 clothing should fit mostly but again not guaranteed. I’ve purchase a lot of different clothing from AZone and so far so good. The rest you really just have to buy it to be able to tell for sure. 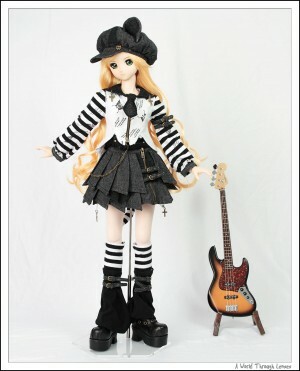 Most of the clothing for 60cm dolls should fit, but may not fit that well depend on bust sizes. Shoes are whole different story because shoes needs to fit very well. So far the shoes I purchased all fitted okay. The few from AZone is a very very tight fit, but still was able to put in. Volks shoes for DDs will fit very nicely naturally but if the shoe is designed to only fit SD it might not look that good depend on actual size. So if you buy from Volks then look at the list the item is designed for. If DD is listed then it’s good. For clothing look for bust size too. You don’t want to buy L bust or DDdy sizes. For all other manufactures, you just have to take a risk if you never saw anyone else put the same clothing on a M bust DD2 body. While I’m still thinking about Nanoha, I’m not sure if I’d then be able to get Yui. 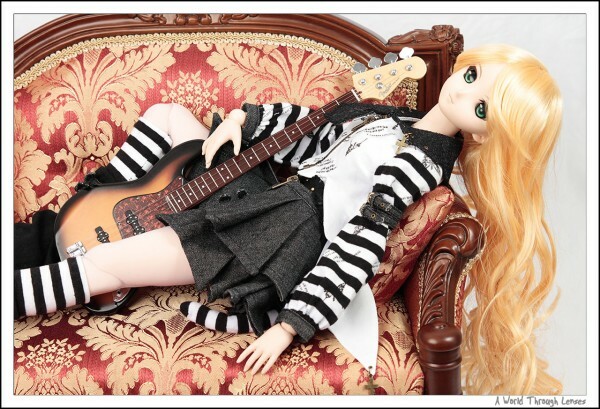 I’m still trying to find somewhere that’s selling Volks Moe dollfie, though no luck yet. I’ve bought her off eBay! But seeing as Nanoha is on her way, it suddenly came to me that I might need things like a stand, and another outfit. I can’t find a stand anywhere, be it round-the-waist or saddle version, and most of the stuff I’m interested in like wigs on the Volks site is out of stock. Also, I don’t know if you wanted me to contact you via email for anything else – I don’t know if having all these comments is annoying or anything to you..